Students at work in my Geometry classroom! This fall, not only did I return to the classroom after a 2 year hiatus as an instructional coach, but I joined and led an Algebra II team that had agreed to launch Standards Based Grading. We were given a week over the summer to upend our current curriculum and start from scratch with the Common Core State Math Standards. With the help of our instructional coach, we had developed a strong curriculum map and began writing our first assessments, rubrics and lessons. We weren’t the first team to take the leap. 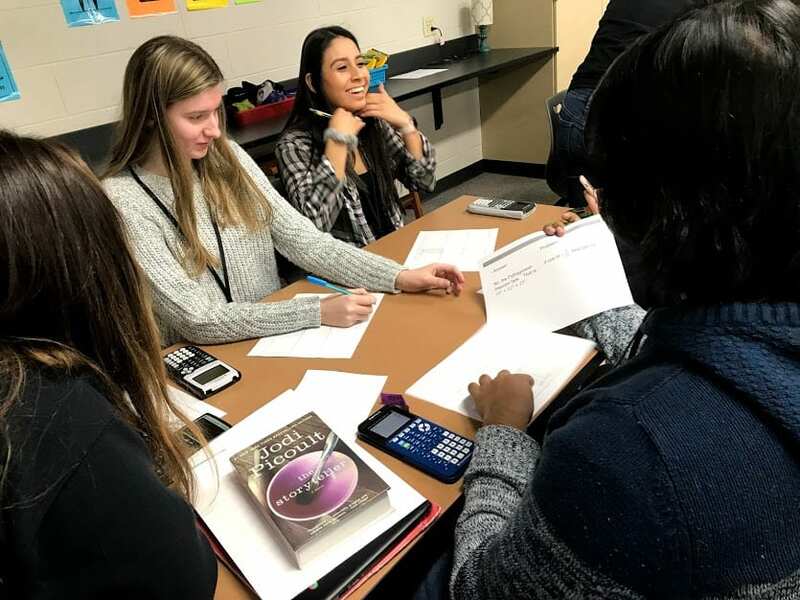 The previous year, the Geometry team was not only the inaugural team to take the Standards Based Grading jump in our department, but also our school. While it wasn’t easy and took a great deal of time and effort to redesign the curriculum and assessments, it was deemed, overall, a success. Room for Growth At the end of the semester I had students reflect on our classroom norms as they related to themselves as a student and as a classmate and, of course, my instruction. On the back of the evaluation, I had them also share their thoughts on Standards Based Grading. I was particularly impressed with the thoughtful reflection of one student, “It favors the students’ education over their grade and the work they complete.” Yes! Another student wrote “(I like how) we retake the test we do to better ourselves.” They’re really starting to get the basic values that are the foundation of our practice: prioritizing learning over grades, and growth over time. But, in reflection, I’d like to continue to prioritize growth mindset language in my classroom. For example, I give pencils that say “Got an A with Mrs. J” for students who receive an “exceeding the standard” rating of a 3.5 or 4/4. I was thinking that I should also give a prize to those who’ve most improved from the first standard to the second in an effort to honor growth. My colleague, Patrick, also suggested that we call the second assessment we give for each standard as the “Growth Assessment.” I like that, too. Struggle with Student Motivation By far the biggest struggle that’s been voiced among my colleagues is the frustration over the lack of student homework completion. Math is a skill and, like any other skill, requires practice. I’ve told students more times than I can remember that mentally assenting to mathematics done correctly does not mean that you can perform the skill as well. You can’t just watch football and think you’re ready for the NFL. Nonetheless students think they can. 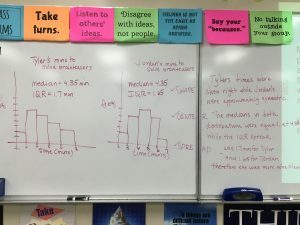 We’ve talked about counting homework for points, but the teachers in Algebra I remind us that student work in their classes reflect little effort and, sadly, copying. They cringe at the thought of giving that caliber of work points towards their final grade. So, we return to making the argument to students about the importance of homework to improve understanding and summative performance. I would LOVE any insight any of you might have! Admiration and Respect for My Team I wasn’t the only one without experience in Standards Based Grading. On the team, which comprised 8 teachers, there was only one who was also on the Geometry team and he was a huge contributor, helping us to avoid pitfalls and encouraging us to focus on what he felt would give us the strongest start. That being said, everyone embraced the challenge and appeared eager to contribute to the major undertaking, which included a division of labor and group edits. While we certainly believed in the tenants of Standards Based Grading, that is, a student’s grade should reflect what they can perform, articulate and understand and not a student’s behavior, we had to be honest about the practical rubber-meets-the-road type pitfalls, such as student motivation. We also needed to reflect on the flow of curriculum, the shifts in our pedagogy, and our team dynamics. We didn’t always agree. In fact, often we didn’t. But, our team is professional, reflective and fun. We tangled until we could live with the outcome and may revisit it again. We are currently on the “act – reflect – new action” cycle of education and are content with that. Truly, I feel blessed to work with such a thoughtful team of educators. Overall, I would deem semester I a moderate success with room for my personal growth. I hope to move forward in shifting mindsets towards growth and away from a focus on grades. I want students to know what they know and what they don’t know. I want them to learn the benefits of practice towards peek performance. And I want to continue the good work of a team that cares about what’s best for students, even if we don’t always agree on how. Also, I’m grateful to have the privilege to work with students. Teaching isn’t for the weak, but it’s the most rewarding job there is. It never gets boring, to be sure. Here’s to the future–have a great 2019! For the last two days I engaged in a voluntary training on restorative practices. Let me first say, that my pool of friends in the world of education is not small. 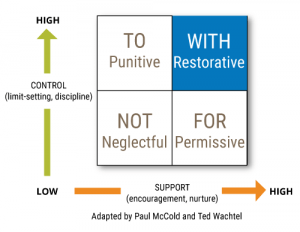 I’ve heard all the opinions on restorative practices ranging from complete buy in to full on skepticism. 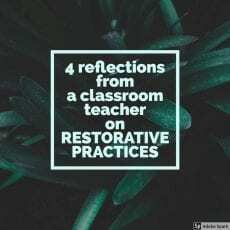 I appreciated the first words from the presenters mouth, “Whatever you’ve googled or heard about restorative, put those out of your mind.” I wrestled with how to frame what I had learned in those two powerful days. Used Exclusively by Dean’s for Conflict Resolution The presenters suggested that we think of restorative practices on a Restorative Practices Continuum that begins with using Affective “I” Statements all the way to formal conferencing for conflict resolution. The International Institute for Restorative Practices (IIRP) also suggests that we spend 80% of our time in practices working proactively and 20% reactively. How do we do that? 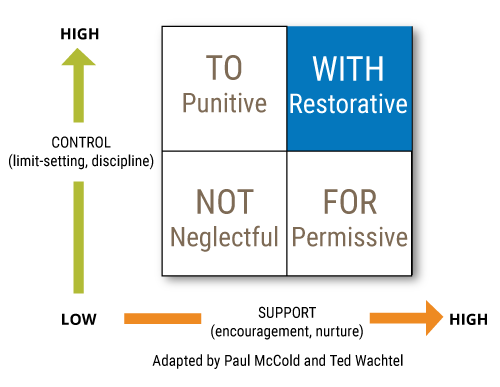 Restorative practices start and end with relationships. I recently wrote a blogpost on the importance of building relationships and followed up with an additional post on helpful relationship building strategies. One powerful tool that IIRP recommends is the use of Circles. Circles are simple to practice. Place your students in a circle and join them. Have a talking piece that you pass around the circle to students to signify whose turn it is to speak and whose it is to listen. While we spent a great deal of time talking about a lot of the nuances: the importance of starting with a low risk question, facilitation rules, setting norms, etc. These are the key steps. Like sitting around a campfire, circles create a safe and intimate place for each student to have a voice. It removes barriers like tables and corners of the room, which are ideal for hiding. While often used for conflict resolution among a smaller group, when used consistently with agreed upon norms it can be a powerful force for relationship building in the classroom. Everyone Gets a Trophy IIRP recommends that you separate the child’s behavior from the child. That is “I like you, but I do not accept your behavior.” The power here is that students need to feel loved and accepted for who they are. When they do, they often change their behavior to be acceptable to those who love them most. Recently I saw Will You Be My Neighbor at the movie theater. According to the film, there was a backlash from groups who decided that Mr. Rodgers was preaching an empty self-esteem message by saying to that children that they “special.” What a sad paradigm. The truth is that everyone has inherent value and is special because they are people, God’s creation. So often we say that students are “bad,” “naughty,” etc. When we label students, we forget their inherent value and worth as human beings and leave all hope for any positive change in them at the door. Rejection of Consequences I have to admit that I was surprised by the general appearance of the two facilitators. They were not school psychologists equipped with data and little in the trenches experience. Rather, they were two men, one black one white, who had physiques similar to WWF wrestlers. Both had a background as deans and had worked in one of the most difficult schools outside the city of Chicago, Maywood, IL. These men knew how to transform the behavior and culture of a school and they had seen it first hand. They were tough guys. Tough guys who believed in the message they were preaching. They shared story after compelling story. One particular story I found extremely convincing was related to two students who were fighting. In the past, they would have each received a suspension and would have returned 5 days later still fuming and ready to go another round. Now, while students might still receive a suspension, they are required to face one another and walk through a series of restorative practice questions that lead to reconciliation so that when they returned there would be a change in behavior. One consequence certainly more work and more fruitful than another. Lowering of Behavioral Expectations One framework that I found particularly helpful related to expectations and supports related to student behavioral is called the Social Discipline Window. On the vertical axis, is the level of expectations and on the horizontal, the level of support we provide students to meet the expectations. We want to work WITH students to improve the behavior to meet high standards. To be honest, I can excuse behaviors at times. Rather, I want to work with students to reach a high standard of behavior that will be expected of them in life beyond my classroom doors. What now? Personally speaking, I left with a renewed commitment for building relationships and plans to practice using “I” statements and implement circles. I’m not sure what that will look like really, but I’m excited to try. I’m thrilled to have the support of our entire administration, who not only participated in this training on a different date, but included the practice in our District Strategic Plan. At the end of the two day training spent entirely sitting in a circle, all 40 of us felt a unique warmth and intimacy with people who had been either strangers or acquaintances to us before we began. We had practiced circles to learn how to implement restorative practices and it had a powerful effect on a group of people with different perspectives and ideas. We closed by sharing something we had appreciated about each person in the room. I felt feeling more hopeful for our country. After all, working through differences hasn’t been our strength lately. But, if we could teach the next generation to work through conflict respectfully…we might just have a bright future and grow in our ability to have a healthy debate and exchange of ideas. Ahhh…hope. As I mentioned in a previous blog post, I am transitioning back to the classroom after serving my school for two years as an instructional coach. While I missed the classroom immensely, I enjoyed so many things about my time as a coach. Collegial Learning One of the greatest frustrations I had while in the classroom was the lack of time to talk, process and reflect with other educators. We are SO busy, yet there is so much we can learn from one another. In my role as a coach I met with individuals, but also had the freedom to create opportunities for small group learning through book studies, PLCs, etc that were rich learning experiences for me (and I hope them as well). I always walk away from time spent with my colleagues learning something new–about their role, classrooms, practice or students. I would say I learned the most this year from Special Educators about the pivotal role they play in our building. Relationship Building When I was in the classroom, my sphere was small and intimate. In coaching I served the whole school and I built relationships all over the building. In fact, I went to classrooms to meet teachers in places I didn’t know existed in our building. This left me with one reflection: We have amazing people committed to serving our students. I am so grateful to have had the opportunity to expand my relationships to include several colleagues, whom I now consider friends. Learning. Period. I spent the last two years in focused learning about NGSS, the Social Emotional Learning Standards, standards based grading, best practices in co-teaching, PLC development, formative assessment, rubrics and proficiency scales, interpersonal communication, literacy strategies (both content and disciplinary)…need I go on? My head is hurting just thinking about it! We did all this to better equip ourselves as resources to teachers grappling with their application. In the classroom, I never would have had the time to spend diving deep into these content areas. Big Picture Thinking Coaches are not administration. Coaches are not teachers. But, they have their feet in both camps. This gave me new insight into how decisions are made at both the macro and micro level. Coaches play an important role in communicating the intent and heart of administration regarding new mandates. Likewise, at least in our building, coaches can share teacher concerns, which inevitably occur when the rubber meets the road of universal mandates. This communication role is key. Without coaches playing this role, the intent behind much of what we’re asked to do is misconstrued and reassigned. I can honestly say that our administration is highly flexible, innovative, encourages teacher independence and autonomy much more than our teachers realize. On the rare occasion that a mandate is given, it is designed with the best for students and teachers in mind. 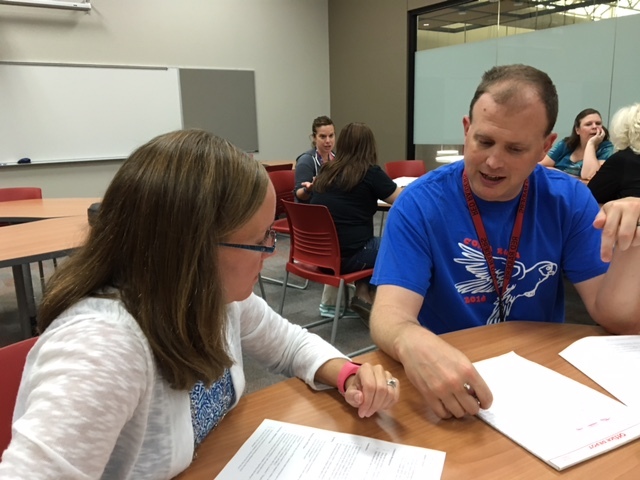 Teachers need Coaches (EVERYONE does) While I love presenting PD (it reminds me of planning the party for students–see previous post), the one to one coaching sessions have convinced me most about the power of instructional coaching. Where else can teachers find a safe place to voice concerns about student behavior, school policy or difficulties within their team? Where else can teachers problem solve while someone carefully listens and asks reflective questions to help them process? Coaching is that safe place and it is a powerful tool for improving instruction and building a positive climate and culture for learning. I was grateful to play a small role in the personal reflection for a select group of teachers. Culture Building Speaking of climate and culture…I love celebrating teachers and students. This is part of the job that I LOVED and will miss a great deal. Whether it be tweeting students in action during engaging activities, sending encouraging emails or plotting fun schemes for faculty meetings, I was in! While I still intend to do that from my new seat on the bus, I enjoyed playing that role for the whole building. MY TEAM I saved the best for last. 3 of my favorite educators and I formed the instructional coaching team at my school. This team, in partnership with one of my favorite APs ever, started the program from the ground up. While we haven’t done everything perfectly, as innovation comes with recalibration, it has gone very well. Most of our 200 staff have engaged in instructional coaching in some way and this is a HUGE victory for a novice team. But, we’ve also earned a “Those Who Excel” state nomination from our district and presented at local and national conferences about our program. I’m so proud of the work we’ve done. On a personal note, I’ve come to love and respect all of them as both educators and people. Can you sell yourself? Part of instructional coaching is marketing; finding opportunities to share responsibility and partner with people. A great teacher without these skills, is a coach in an office by his/herself. Are you a self starter? In our building, coaches are given great freedom to innovate. During my time in this role, we developed courses, book clubs, lunch and learns, attended PLCs, generated clientele with whom we worked one on one, worked with department chairs to develop differentiated PD by department, developed co-teaching PD, designed SIP days, attended and presented at conferences…we were given parameters, but then told to go… and we did! Do you enjoy partnering with people? Most of the work in the coaching world is collaborative. You own very little of your own work. This, I’ve learned, is amazing. After all, two heads working together always yields a better product than one. and administration that I wanted to return after the first year, but after listening attentively to me, they encouraged me to stay saying they felt I was well-suited for the role and perhaps with more experience and confidence, I might feel differently. However, my administration said they’d support my decision to return, if that’s what I wanted.I decided to spend another year serving my school as a coach. There were MANY things I enjoyed about instructional coaching, and I plan to share them in another blog post. But, let me share the key reasons I’m returning to the classroom. Kids Without a doubt, the number ONE reason I want to return to the classroom is my desire to work with kids. When I walk down the hallway, I well up with the empathy I feel for students whose eyes reveal their insecurities. I want to engage in their conversations; speak truth and encouragement into their lives. But, I’m always one step removed. Even when working in classrooms, I was the lady who came into their class for a day, and at most, a few days. It’s hard to build drive by relationships. After being out of the classroom for two years, the number of students with whom I had relationships had significantly dwindled and the thought of getting to a point where there were none was devastating to me. Party Planning While I’m no Angela Martin (Office reference), I love planning the party and watching the magic of learning happen. In coaching, you help to plan someone else’s party for someone else’s students. I miss designing creative ways to engage MY students and watching the joy of MY students as they learn. It’s entirely selfish, I know. Perhaps a person who is more selfless would be more comfortable riding in the sidecar, but it was a tough transition for me. Focus I LOVE to learn, and coaching allowed me to open up my learning to include all content areas. I have an increased passion for literacy strategies, the NGSS practices, best practices in co-teaching and other content areas as well. But, I miss being able to have one focused passion. I LOVE MATH! A colleague once shared with me how she remembered when I was in the classroom, I had made students love math, too. Yes! That’s what I want–for them to love it with me; to build their confidence in a content area that opens countless lucrative opportunities for them. Beginnings and Endings Yes. In coaching we have a beginning and end to each year and there are timely PD opportunities we like to offer teachers. But, there is nothing like a brand new class list, planning for community building, and getting excited for a first day. Likewise, there is no greater relief for a teacher than closing the books on the year, knowing you’ve poured yourself out as best you could for students. I love a clean slate. I missed it in coaching. All this being said, I hope my school knows that I have loved serving them as an instructional coach the past two years and am so grateful to have had the opportunity. I appreciate my administration’s encouragement and the confidence they’ve had in me. I’ve grown so much as an educator and I hope to share my experience as a coach in my next blog post. “Anyone? Anyone? Bueller? !” That iconic line from the movie Ferris Bueller’s Day Off demonstrates the futile nature of asking unanswered questions to a group of disinterested students. But, we’ve all been there, haven’t we? We wonder if it’s the question, our instruction, the students? Whatever it is, it is not the Dead Poet’s Society classroom we had envisioned when choosing teaching as a profession. We’d like to craft the questions that draw students to engage in lively debate. How do teachers do that? What is the magic spell they cast over their students? Ask questions worth asking. Oftentimes our questions aren’t that interesting or just rote drill. Ask questions that require students to explain concepts, their thinking or personal connection to the content. Questions that include verbs at a higher Depth of Knowledge level typically are “discussion worthy” and will lead to greater debate, discussion and engagement. Also, asking more open ended questions, for example, instead of asking “What is the first step here?” you might ask “How might you solve this problem?” which provides students the opportunity to make their thinking transparent to the class. Prime the pump. 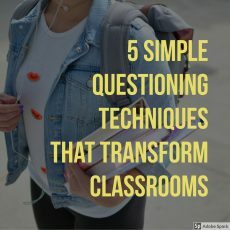 After asking a question, require ALL students to respond to the question with a partner, on paper, or in some way in order to commit to a response, and THEN pose the question for class discussion. You’ll find that your students will be MUCH more eager to respond. Declare a minimum. Wait time is important for students to formulate an answer (6-10 seconds is ideal), but saying something like “I need at least 8 hands” OR “Raise your hand when you know,” which implies that everyone should raise their hand at some point, often yields great results. Catch and release. When a student responds to a question, avoid the urge to either approve or disapprove of the response. When a teacher declares something right or wrong, the conversation is over. Rather, ask the rest of the class if they agree or disagree with that student’s response and explain their reasoning. You can also ask, “Does anyone want to add on to that or amend it? If so, in what way and why?” That keeps the discussion flowing and engages the class. Declare no student off limits. We want all students to formulate an answer to our questions, not just a select few. If it’s worth asking during class time, then it is a valuable exercise for all students. One of the areas that new teachers, in particular, struggle philosophically is calling on students who don’t volunteer. Often they share that they are worried that they might embarrass a student who doesn’t know the answer. I will encourage them with this, “If you allow students to prime the pump and ask open ended questions worth asking, students will be much more comfortable responding.” If you find a student answers, “I don’t know.” You can respond with, “What did you and your partner discuss?” or “Tell me what thoughts you had when thinking about the question.” If we create an environment that only tolerates correct answers and does not make transparent the conceptions and misconceptions around ideas, then students won’t risk sharing ideas at all. It’s up to teachers to make sure students know that it is natural part of learning to process to expose and refine ideas. Like all new routines in classrooms, these questioning shifts will take a few days to a week to hone. But, if you are faithful in implementing them, you WILL transform your classroom discussions! If you have an instructional coach in your building, invite him/her to observe you and help you tweak your mad questioning skills. A second set of eyes always helps. Let’s do it, “O Captain, my Captain!” Get them talking! As always, I’d love to hear what works for you (and might for me 🙂 ). Depth of Knowledge Wheel Webb, Norman L. and others. “Web Alignment Tool” 24 July 2005. Wisconsin Center of Educational Research. University of Wisconsin-Madison. 2 Feb. 2006. The term “fake news” was introduced to every day vernacular by our current president. Since then, it has been assigned to just about any reporting that was unfavorable or news that did not support one’s personal world view. 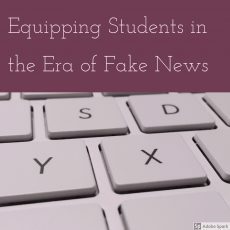 Rather to dismiss these claims, however, we can teach students what constitutes “Fake News.” Let’s focus primarily on web sources, since our students will typically begin their research there. Determining what news is fake or real is harder than we think. I read an article by Tennessee Watson entitled “To Test Your Fake News Judgement, Play this Game.” The game, Factitious allows you to test your fake news radar. Sadly, not even this educator (two thumbs pointing at self) could successfully detect real from fake news. Go ahead, you give it a try! See if your fake news radar is better than mine. Difficult? I know! My thoughts began to center around the danger this posed for students in what seems to be a post-truth world of information. If YOU don’t teach them, who will? Oftentimes, I think research skills are dismissed by content area teachers outside of English or Social Studies. If your students use the internet to gather information (and they SHOULD), this falls on your shoulders as well. We tend to over-scaffold our students, sending them to sources that have already been vetted. While that will provide them with reliable information for now, it will not prepare students for life beyond the classroom. Without the appropriate skills to equip students with discernment, the internet is the modern day equivalent to the Wild, Wild West. We are sending them unarmed, vulnerable to sites that appear factual, but present “alternative facts” upon which they will build their beliefs and world views. Media Bias and Fact Checkers After playing Factitious, I realized that I could not discern fact from fiction based on the title alone, rather the reliability of the internet source was much more likely to influence whether the information was reliable. Since then, I’ve used Media Bias/Fact Check which offers researchers a rating on two key indicators: bias and factual reporting. While every source typically has some bias, the factual reporting can help readers to determine the factual reliability of the source. Since the website seemed difficult for me to navigate, I found the quickest way to check a source like, for example CNN, would be to type “media bias fact check CNN” in the Google search bar, where you’d see this report which rated CNN a left bias with mixed factual reporting, similar to it’s conservative counterpart FOX News. What is particularly helpful is that propagandist news sources such as the Conservative Daily and it’s liberal counterpart, the Democratic Review, are reviewed and clearly deemed “Questionable Sources” by the site. A Powerful Exercise in Media Review If students are always given texts that are reliable by teachers, they will come to the conclusion that all text is innately reliable. To convince students otherwise, you might engage in research on a topic in which there is an abundance of research on all sides of the issue. Assign students different articles from all along the spectrum. Create a horizontal line placing opposing views on either extreme. Have students determine where to place their assigned article based on what they deem is it’s appropriate place based on evidence from the article. This exercise would not only allows students the opportunity to reflect on bias and opposing viewpoints, but also would prepare students to make well-informed claims on the topic based on a plethora of evidence from all points of view. For teachers to quickly access texts representing multiple views all along the spectrum they can use a web resource called All Sides which allows users to search a topic and sorts web resources by left, center and right. Another Powerful Exercise in Media Review In order to help students to reflect on how they search, ask them to engage in this meta cognitive exercise. Here’s what this might look like. Quick write a few personal thoughts in response to the question. Search the internet for an answer. Write down ALL the steps you took to find your answer. Students can share each step and categorize it is a good or questionable practice for internet searches. After that, the teacher engages students in a conversation about how each of the topics can influence how they might search for information on the internet. URL Common Sense Which sites are typically more believable: those ending in .org or .com? Students think that .org is typically more believable. After all, pbs.org is a fabulous, altruistic site that students enjoy. I wonder if they would maintain that opinions if they knew that Neo Nazi websites would also typically carry a .org URL? Also, they typically believe .com must be unreliable since it is typically associated with commercial use, therefore sites bearing it’s name are trying to sell us something, right? Keep in mind that most mainstream news sources carry that domain extension. This is certainly a conversation worth having with our students. First is Not Always Best The website that tops the list of our Google searches is chosen not because it is the best or most reliable source, rather it is the most popular source. That is, it has received the most “clicks.” With concern about bots and political activism, we cannot rely on the fact that what is most popular is also most reliable. Authority of Source When students research for answers, they may stop the search at the title. In order to access the evidence and reasoning upon which the claim was built, students must read, or at least skim, the article. Is the conclusion based on the work of an expert in the field? What makes someone an expert in a field? Was quantitative or qualitative data used to reach that conclusion? All of these questions must be answered before a student can accept the claim upon which the title was built. I’d like to thank Patricia Tylka for the two very practical strategies in this article. She presented a fabulous session entitled Coaching Digital Natives through Research in the Age of Google at the Illinois Reading Council’s Annual Conference this weekend. 2 Days of Relationship Building? But how? We’ll be starting school a week from today but many teachers have already begun. Relationship building can (and should) happen all year. That being said, carving out the first two days for connecting with students sends a clear message: “You matter to me and we matter to each other.” After all, no student runs home to share their excitement over learning rules and procedures on the first day. Let’s give our students something that will make them excited about the school year and looking forward to tomorrow. Share YOURSELF! Prepare a short presentation that includes your interests, family members, love for teaching, and most recent learning experiences. Share PICTURES. Share a time when learning was hard for you and you persevered in it. Share your personality and quirks. I used to tell students that my daughter thought the word “adorkable” best described me. It is amazing how disarming it is to students when teachers admit their humanity, struggles with learning and genuine passion for teaching. I LOVE these 5 questions to ask your students at the beginning of the year from George Couros. They really probe into the heart of students! What are the qualities you look for in a teacher? What is one BIG question you have about this year? What are your strengths and how can you utilize them? What does success at the end of the year look like? In addition to surveying your students, COMMIT to getting to know their names and saying them CORRECTLY. I know this can be challenging, especially if the students in your classroom come from a tradition other than your own. But, your effort to know the name by which they’ve been called their whole lives speaks volumes. Name tents can be helpful with that. 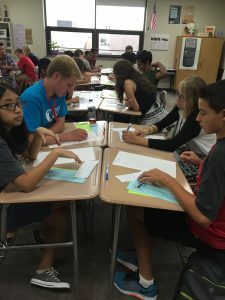 Teachers have also used the inside of name tents for students to provide some feedback like Sara Van Der Werf, high school Math Teacher from Minneapolis. You can find her example here. Build COMMUNITY through relationship building! Generating Norms One of my favorite activities on the first day is to put students into groups of four and give them an envelope of icebreaker questions. In doing this activity, I explain to students the procedures for getting into groups and we begin the discussion on group norms. The best way to arrive at student generated norms is to ask students, “What makes group work horrible?” Have students work in their groups to write down each idea/problem on an individual sticky note. 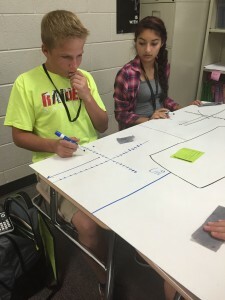 Students then can place sticky notes on the board, placing ideas that are similar together. From there, the class can generate a list of positively stated norms for the class to follow. For example, the complaint “One person ends ups doing all the work” can be avoided by the positively stated norm “Everyone will contribute to the group work.” If you have more than one class (as in middle school or high school) you can take the sum of all the norms from your classes and generate a list for ALL of your classes, to avoid your own personal confusion. I would also suggest that you make posters like Sarah Carter’s (aren’t they amazing?). While I advocate for explicitly teaching and modeling rules and procedures, I believe they are best demonstrated in context. By that I mean, when you need them. Want to teach the paper passing procedures? Wait until you have to pass out or pass back papers, etc. Plotting Personalities I believe I learned this from Dan Meyer and I LOVE this for math, science or even social studies (any subjects that use axes to graph information). 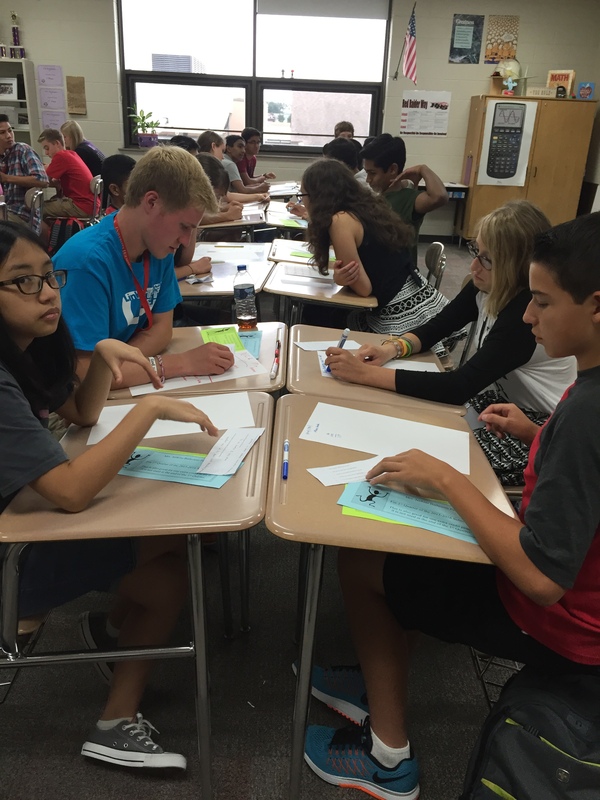 Have students create an x/y axis and label them with personality traits as they’d like. 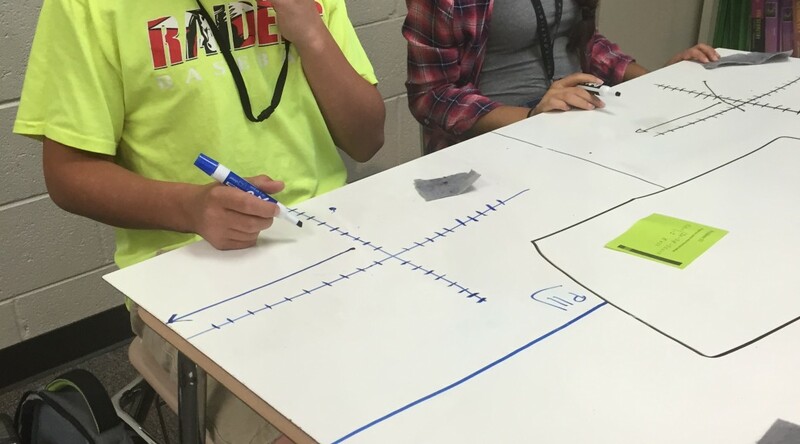 Perhaps the x-axis measures “Structure” and the y-axis measures “Sociability.” Students can graph a point with their name on the coordinate plane they feel their personality would land and then, explain WHY! It makes for a great conversation. Two Truths and a Lie I love this one, because I use it for content related material throughout the year. Have students create three statements about themselves–two are true and one is a lie. The other students guess which is the lie. The goal is to make all three statements seem viable or not-viable. In doing this, we learn interesting, perhaps even unbelievable, things about our students. Me, too The first student gives a fact about themselves—I love basketball, I have two sisters, etc. If that statement or fact is true about another student, they stand up. Continue until you’ve gone through all students. Require students give a statement that wasn’t previously given. It will get more tricky (and fun) as you move towards the end of the class. Breakout EDU A colleague of mine did a GREAT team building activity on his first day last year. He created a Breakout EDU. What’s that, you say? 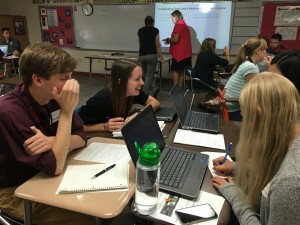 Similar to breakout rooms you’ve seen popping up, Breakout EDU challenges our students’ ability to problem solve and collaborate to “breakout.” Gerry Marchand, Biology/Anatomy teacher from Illinois (and personal friend), blogged about the experience, which you can read here. Use CONTENT to Puzzle Find something related to your content that you’d like your students to discuss and debate in order to generate a creative solution. I have a colleague who asks her geometry students to decide where the new Chipotle restaurant should be located in town. Students will discuss proximity to roads, centrality of location to ensure fair access to all residents in town (after all, it’s Chipotle! ), etc. So fun! The precedent you set in the first few days sends a powerful message to your students. After all, if we want to commit to the powerful collaborative work of the 21st century skills (as discussed in my previous post), we have to cultivate the soil. That begins day ONE. I hope your first few days are amazing. PLEASE feel free to share ideas on how to best connect with students in the first few days. Let’s connect, educators! The more ideas, the better! Category: Uncategorized | 3 Comments on 2 Days of Relationship Building? But how? 2 Days of Relationships Building – But, why? A colleague of mine once taught in a school where teachers received a directive to spend the first two days of school working exclusively on relationships. Why? 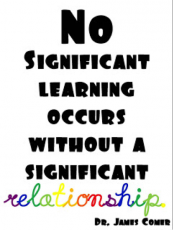 Yale educated child psychologist James Comer claimed that “no significant learning can occur without a significant relationship.” I believe that truth and hold it as a personal value. Might I suggest, however, that relationships are even MORE important now than in generations past? If you haven’t noticed there has been a MONUMENTAL shift in education. After all, for most of the history of American schooling has been centered around providing, what was deemed, important information. In the era of the internet, students find themselves with a plentiful supply of information. It is readily available at overwhelming quantities and speed. That being said, the lower parts of Bloom’s Taxonomy are becoming increasingly less relevant. Rather, the world and workplace demands we ask students to engage with information at much higher levels. Consider the 4 Cs of the 21st Century Skills and how they might influence the value of interpersonal relationships in the classroom. Collaboration I’m sure when the great minds behind the Partnership for 21st Century Learning formulated the 21st Century Skills, they did not simply intend for students to sit in close approximation while independently looking at their phones or working on their projects. Rather, they envisioned lively debate, discussion, and a greater product for having worked together. Asking students to engage at this level is no easy task. However it begins with building relationships. After all, I do not risk sharing ideas, let alone dare to disagree with others, if I do not feel the trust and safety to do so. Think of your best collaborative piece of work. Did you accomplish it with virtual strangers? OR people with whom you shared a trusting relationship? Critical Thinking In the CCSS Mathematical Practices, this might manifest itself in the 3rd Mathematical Practice which includes “critiquing the reasoning of others.” Yep! I’m not doing that! I don’t feel comfortable correcting the work of a complete stranger. Might they be offended? Will I look like a know it all? The safety to do so, my fellow educators, is a culture we must build in our classrooms. We must communicate to students that whether they be right or wrong, we debate ideas. This is a safe place to do so. We must have an engineering mindset. Let’s share ideas and then improve upon them with each iteration! Creativity Let’s face it–we need people to find solutions to serious problems we face. Information is not the problem. We need people who can look at them with a new and creative lens. That being said, some ideas will sound crazy–until they are crazy good. Someone will have to be the first to throw the spaghetti on the wall to see if it sticks. After all, Rutherford B. Hayes scoffed at Alexander Graham Bell’s telephone, saying “Who would ever want to use such a thing!” Your classroom has to be a safe place to openly share ideas. Oftentimes, the most creative people are often the most quiet in the classroom. Getting them to speak and risk the sharing of ideas, will take some cajoling on both the part of the teacher and encouraging peers. We must daily put relational deposits in the emotional bank of introverts. Communication After 23 1/2 years of marriage, I think my husband and I have mastered communication. It took about 10 of those years for us to really make it work. It’s getting more difficult now that we are both older and our hearing is waning. It is not unusual to hear one of us screaming “What?” from another room. That being said, communication is one of the most relevant skills for one’s personal and work life. It allows us to deeply know and understand another person and their ideas. It also helps us to accurately communicate our thoughts and feelings, in order to avoid the unnecessary and emotionally draining drama of being misunderstood. That being said, face-to-face communication is becoming a lost art. I’m not judging. I, too, have caught the smart phone bug. As educators, we must realize as information has become more accessible, opportunities for our students to engage in face-to-face communication is decreasing at alarming rates; and not without consequence. Our classrooms are a laboratory for practicing this essential life skill to build both empathy and understanding. On this particular “C” I would say the needs are flip-flopped. You don’t need relationships to build communication as much as you need communication to build relationships. So, let’s start there. Let’s communicate with our students and give them ample time to communicate thoughts and ideas with one another. We can teach them the art of active listening, talk moves in response and academic risk taking. It’s an exciting time to be a teacher, but the demands are different. 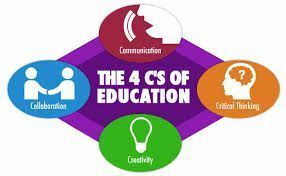 Let’s teach them the 4 Cs in the context of our content. Let them talk about math, create solutions to the world’s science-related problems, let them communicate their thoughts and ideas about the Civil Rights Movement. All of this will happen more powerfully if we invest in the building of relationships. If you’re on board but you want some new ideas on how to build those relationships…I’m working on that post next! If you have ideas, please share! Just for fun, here’s a fun 4 Cs Poster for your classroom from the Partnership for 21st Century Learning. Curley, R. (2010). The 100 Most Influential Innovators of All Time. New York, NY: Britannical Educational Publishing . Scherer, M. (1998, December). Is school the place for spirituality? A conversation with Rabbi Harold Kushner. Educational Leadership, 56(4), 18–22. I am instructional coach and challenging thoughts about practice because “that’s what we’ve always done” is part of my job. I start with my own. I’m a product of 16 years of traditional US education and, let me tell you, I was GREAT at it. I loved grades. They were part of my identity: hard working, law abiding, bright girl. How many of my views about grading came simply from my experience? Assessment is a hot topic at school. People are asking good questions, but change is scary–and we don’t want to change things for the worse! It’s time for a thoughtful look at assessment. To that end, I spent the summer taking an online course on assessment. My last assignment was to develop my personal philosophy of assessment. Grades should measure student performance towards achieving the standards and not behaviors. To that end, standards must be made clear to students and should be an integral part of the instructional process. Students learn best what they are expected to learn is clear and they can assess their own progress towards the goal. That being said, grades should be assigned at the end of learning, that is, for summative assessments, alone. In addition, since behaviors have nothing to do with the standards, including them in the grade would taint the accuracy of the measure. Such behaviors include, but are not limited to, late work, absenteeism, and cheating. Those behaviors deserve a behavioral consequence. Students should be given ample opportunities to demonstrate their learning. The shop for learning should remain open as long as is feasibly possible for the teacher and student. That is, I believe in retakes at any time. I believe students must earn the right to retake by showing they have done sufficient work to be able to demonstrate mastery for the standard that they were unable to perform previously. I believe in using a four point scale over 100 since there is greater inter-rater reliability. Frequent, clear and positive feedback and student reflection are essential to learning. Formative assessment should be ungraded, provide feedback that a student can act upon, and positive in nature. It is our instinct to find errors and correct them, and that is important. However, feedback, particularly in standards that are demonstrated best by writing or presentation, can actually be more powerful when a teacher highlights the strengths of the student’s performance and then make suggestions towards improvement. Formative feedback may be simply a conversation between teacher and student (conferencing) or can be written feedback on a formative assessment. Providing time and a structure for student reflection towards his/her own progress towards the standard is a powerful tool for the future, teaching students how to monitor their own learning throughout their lives. When it comes to standards, less is more. US math text books contain 175% of the number of German standards and 350% of what Japanese texts cover. Both countries outperform the US in math (Schmoker). That being said, we should carefully select which standards are essential for student learning and report on those standards alone. If time is prioritized to treat each standard with due diligence, students will be able to access the standard at a level of greater understanding and rigor. Standards should be assessed at an appropriate level of Depth of Knowledge. If the standard is “to make inferences,” for example, simply identifying a correct inference from a select response item is not asking students to perform the standard as intended. Rather, asking students to read a passage and then, make an inference providing evidence for their reasoning from the text, is better suited to the standard. Assessment is best when it is authentic. For example, asking students to compare and contrast two different systems of government is best done in either a presentation or written form, not a standardized multiple choice test. When assessing speaking and listening skills, students should be assessed performing those skills in a manner they might be expected to in the future—before a real audience outside the classroom would be even more powerful and would motivate students. Standards should be assessed more than once and by a variety of means. In fact, a standard assessed by three different means is ideal and is referred to as a “triangulation of data.” In addition to written exams, portfolios, blogs, videos, essays, presentations, projects are all viable methods of assessment. Growth mindset goes hand in hand with standards based assessment. Students must know that all formative work is to prepare them to master the target. The focus should be on learning and not on “point getting.” Initially failing to meet a standard while learning, is expected and normal. In addition, allowing students to retake assessments in order to improve their performance provides hope and motivation for them to continue to learn. Differentiation is important for student learning. That being said, students who are working toward standards that are above or below his/her grade level standard is appropriate, but should be denoted when reporting out to universities. High school level students who are working towards grade school standards should be measured against those standards alone. However, it should be noted that they are working at grade 6 standards, for example, on their report card. Likewise, students taking courses that require students to master more difficult or additional standards should be rewarded as well. This has traditionally happened through a GPA bump. **Note: I’m not sure how grades for special needs students are reported at my school. This are my thoughts alone. This is my CURRENT philosophy on assessment. It is organic and a work in progress. I’d love to hear from you–feedback? Questions? Thoughts? Schmoker, M. J. (2011). Focus: elevating the essentials to radically improve student learning. Alexandria, VA: ASCD. 3 Simple Suggestions: Growing as a Team–without derailing it! Growing isn’t easy. Thus, the phrase “growing pains.” Yet, we work in a field that is a highly interpersonal, social experiment in learning. In fact, teams of teachers are assembled to improve teaching and learning, creating opportunities for students to live their best lives possible. It is noble and important. That being said, teachers certainly don’t walk out of our teacher training programs and into the classroom as the best version of our teacher selves. We have to grow! But, as I mentioned early, growing is painful–especially for groups. There are several reasons why this is the case. In the last 10 years, the greatest decisions for change were legislated at the state and federal level (No Child Left Behind, Response to Intervention, CCSS, NGSS, C3, PBIS, etc). These sweeping changes cannot be simply adopted overnight. After all, in order for meaningful change to occur, teachers need to understand the desired change, believe it is what is best for students, and then be provided time and training to implement the change. This is no easy feat! While many districts do their best to provide what is necessary to accomplish those things, what often is not addressed however, is how the stress of change affects a group. Studies show that people will respond to change in different ways. A select few will be “Innovators” or “Early Adopters,” also a small number will be considered “Laggards.” Most likely your personality will determine where you’ll land. Imagine now, that these people are all in the same room tasked with change. The Late Majority and Laggards are often traditional and skeptical. It takes time to for them to internalize the need for change and make important shifts. That being said, if they adopt them, they will do so judiciously. Innovators and Early Adopters are often frustrated with the apparent “unwillingness” to change on the part of Late Majority and Laggards. This will influence their perceptions towards one another negatively and add to the stress of group change. Innovators and Early Adopters will most likely be eager to get the ball rolling. After all, why not? 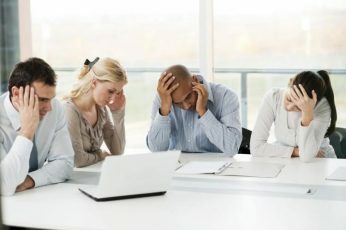 However, to the Late Majority or Laggards, Innovators and Early Adopters can appear “rash or daring.” The (often necessary GENTLE) pressure to adopt change can be a great source of anxiety to this group, and can manifest itself in anger towards or negative judgments against their colleagues. Recognize the feelings behind the behavior. If teachers seem angry or frustrated, there is a reason behind it. Is it because the teacher is not convinced that the change benefits students? Are teachers avoiding work because they hope the pressure to change will just disappear if they ignore it? Are they just overwhelmed by the stress of change? All of these are normal reactions, but certainly need to be addressed for a group to work effectively and move collectively towards the goal. Provide time and training to reduce group stress. As mentioned before, teachers need to understand and believe the innovation is good for students. I don’t know any teachers who, when convinced that there is a better way to serve students, refuse to do so. To be convinced, teachers will need to see the innovation in practice and data that supports the need for change. Meaningful professional development will clearly outline the innovation, rationale for change, and practical strategies towards change. Also, instructional coaching can play a role in group change. Instructional coaches can partner with teachers, making the innovation feel less intimidating as teachers bring the change into their classrooms. Without time and training, the pressure associated with change can feel like a turning vice for a group. Change in education is inevitable, and need not break your group. Acknowledging personality differences and group dynamics will help you all to keep your sanity in the pursuit of a better way to serve students. At the end of the year, take some time to acknowledge all you accomplished and, though difficult, discuss how you are all better for it! For more information and resources for dealing with stress of change on your PLC, see this fabulous Learning Forward newsletter. 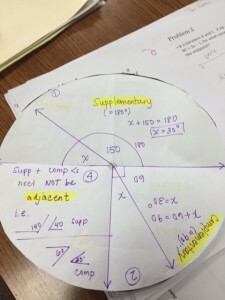 These are a FEW of my Favorite Things… I’ve used in my math classroom. Thank #MTBoS! I am a member of the #MTBoS (Math Twitter Blog-O-Sphere). If you are a math teacher, you are too! To find them, you need only jump on Twitter (@ExploreMTBoS) or search the #MTBoS hashstag and enjoy all that is available to you. #MTBoS teachers share everything from their philosophy on what is BEST Math Teaching PRACTICE to the details of the lesson they did TODAY. The #MTBoS has challenged its members to blog once a week for the next month. This week, the challenge is to blog about our favorite thing(s). Here are some of my FAVORITE THINGS I’ve learned about/stolen from this group. WODB (@WODB) or “Which one doesn’t belong?” has been a fabulous resource for eliciting high level discourse with students. This puzzle can be found on the WODB website and also on Chris Hunter’s “Reflection in the Why” blog. 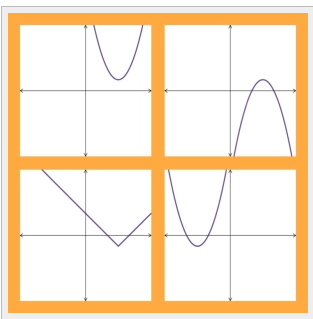 These WODB K-12 puzzles are low entry/high ceiling problems that will meet your students exactly at their level of understanding. Your job is to push their thinking by asking questions. I’ve shown an Algebra example to the right, but there are graphs, number, shape puzzles, etc. Enjoy them! Here you can see “Class Norms” above my board in my classroom. two purposes in my classroom. ONE: They are darling and decorated my room nicely and TWO (and most importantly): They served as principles that guided the collaborative work in my group. I only had to say “Helping is not the same as giving answers!” or “Can you read the green sign I am pointing to? What does that mean? Please be a respectful group member and do that now.” I LOVED having them to point to! “Function of Time” blog. For each skill, you make four problems of various degrees of difficulty and for students you’ve placed in a heterogeneous grouping. Each student works individually and then, students sum up their totals. At that time, they can ask the teacher if they are correct. If they are NOT correct, the students have to decide which student(s) made the error and why. This leads to great mathematical discourse and “critiquing the reasoning of others.” You can find more details to this fabulous activity in the link above. Classroom Climate–Does your room have a positive or negative vibe? Do students want to or even look forward to coming to your class? Are students kind to one another? Student Collaboration–Are they really collaborating or just seated closely? Is there individual and group accountability? Do students hold each other accountable? Instruction–Are you bored by your own lessons? Is your instruction teacher or student- centered? Do your lessons require students to go beyond note taking? Are students invested enough to debate and argue? Are students given the opportunity to grapple with tough questions and space to problem solve? Assessments–Are your students given opportunities to think critically? Do your tests reflect higher order thinking? Is everything on your test “Googleable?” For more advice on creating questions that are not “Googleable,’ click here. Do your assessments give students opportunities to demonstrate what they really do know and understand? 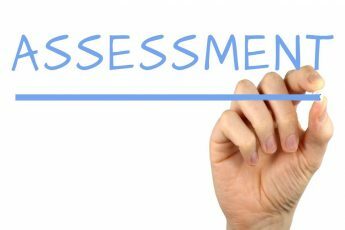 Are your assessments tightly aligned to your standards/targets/objectives? Curriculum–Are you “covering” too much? Does it feel like your students are only getting a superficial understanding instead of a rich understanding? Is it time to consider removing content that you’ve typically covered? NEWSBENJIVERTS. I’m not even sure how that’s spelled. I was introduced to this acronym while watching this episode of the Middle where Brick, the little brother, tries to coach his sister, Sue, for her audition for the school newscaster position. Brick starts with this small acronym to help her to remember key newscaster skills: NEWS; Natural, Eye contact and Winning Smile. But, Sue needs so much help it grows to NEWSBENJIVERTS. During her audition, she is so overwhelmed by her the huge acronym that she performs with huge eyeballs, an awkward smile and, frankly, looks ridiculous! All this to say we often look ridiculous to our students when we tackle more than we can handle. We end up back-tracking on our commitments, which only breeds a lack of confidence in our words and actions. Choose ONE, maybe two, things to tackle. Larger, sweeping adjustments can come next year. Ask yourself probing questions to problem solve. After you determine what you’d like to change, ask yourself how this student behavior, instructional approach, classroom culture, etc. has become a pattern in your classroom? What is the root of those behaviors? Come up with at least several causes beyond student motivation or administrative mandate to these problems. After all, you have no control over them. Look for causes within your circle of influence. Make a plan to address them. This is where the internet and your colleagues are great resources. If you have instructional coaches in your building like I do, you might want to elicit their help in brainstorming solutions or processing root causes. Everyone needs a pep talk. Okay, it’s your first day back. Imagine your classroom is a locker room full of athletes and they are looking eagerly to you, their coach, as you prepare to give them an inspirational half time pep talk. Don’t let them down, Coach! Remind students that you are there for them, care for them, and want them to be successful. Tell them what they, as a class, did well last semester and point out areas where they are growing but aren’t quite there yet. Tell them second semester offers a fresh slate. Tell them that you expect that second semester will be challenging, but that you’ll get across the finish line together. However you word it, speak it from your heart. Kids can smell insincerity a mile away. Take a moment to reconnect. Show pictures of how you spent your break. Give them an opportunity to share about their adventures. When we do this, we are creating a safe space for students and communicating that we care about them. It also allows them to open the doors of communication with a topic that is comfortable for them. This will make it easier when you ask them to engage in content related discussions. Honesty is the best policy. Okay, time to get real. It’s time to make a change. You don’t have to pretend with students. Unlike administrators they are there every day and know exactly what it is like to be in your classroom — for real! Share how you’ve reflected over your break and your plan to reset for second semester. One caveat: if you say you are making a change, you have to stand by it. Telling your students means they WILL hold you accountable–as they should. When choosing a solution to your problem, choose a plan that you can carry out. Avoid developing systems that will be difficult to manage. You’re too busy for that! Who doesn’t love a fresh start? Let’s make a resolution to keep making resolutions. After all, the key to our growth as educators (and people) is reflection, plan, change, REPEAT. Keep fighting the good fight, my friend! The fruit of growth is always joy. Always growing. One of my favorite things about teaching is that it NEVER grows old. Each year you’ll meet new students, new colleagues, perhaps teach a new course. Circumstances aren’t the only things that change with each passing year, our thoughts about teaching and learning change, too. That is, if we continue to grow and learn. I have a ravenous appetite for new ideas. Thanks to the internet (predominantly Twitter) there is no end to the creative ways I can teach students. If it was something that worked well in class, I would burst if I didn’t share them. As a classroom teacher, I’d like to think I was generous with my findings, but as a coach it’s my job. The luxury to scour the internet and think systemically on how to best encourage and support good teaching school wide is not lost on me. I feel blessed. I LOVE to talk shop! I find most teachers do. Even teachers who might not admit it if you asked them. If you start bringing up issues related to teaching and learning (growth mindset, PBL, etc), the ideas and opinions will fly. Mixed in those opinions are arguments for pedagogy and philosophy that influence practice. This sharpening of irons spurs growth. Ironically, at least in my building, there is precious little time for productive teacher talk. Coaching lets me talk teaching all day. The only difficult thing is that by nature people (including yours truly) are reluctant to change and can be initially defensive when their regular practice is challenged in anyway. However, I’m hoping most teachers ruminate on constructive criticism and come back willing to try new ideas. I love this quote from Elena Aguilar, “The art of coaching is the art of nudging without leaving bruises.” So true. I want to push to the point of “cognitive dissonance” but without closing relational doors. I do believe this is an art and I’m hoping to master it. I’m nowhere near an artist. Right now, I’m a two year old with crayons. LOVE is my quintessential core value. “Above all, put on love which binds us together in perfect unity,” Colossians 3:14. My hope is to be loving and kind in every interaction, to believe the best, seek the best for and encourage the whole teacher. My motto this year has been “teachers are people, too.” We have personal battles, health crises, families that need our attention and, let’s face it–teaching is hard! I hope that teachers feel as though I’m on their team–even when they resist change–I’m FOR them! Coaching gives me the time to listen and empathize with their concerns. As a teacher who tried to do that for students all day, I often didn’t have time to stop and give undivided attention to my colleagues. I can and do make time for that now. One of the best things I’ve ever done as an educator was join Twitter. I really didn’t understand it at first, but the connections I made over time have impacted my classroom more than any other face to face professional development. The teachers of the #mtbos (Math Teacher Blog-O-Sphere) have had the greatest impact. 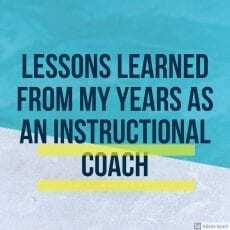 They’ve recently started a blogging initiative and I thought I’d participate, which might be challenging consider that I’ve moved to an instructional coaching position this year. But, I’ll try to do my best to adapt the questions to my new role. Blogging helps teachers to be reflective–honestly, a luxury for which few teachers have time. Nonetheless…important for teacher growth and satisfaction. If you haven’t started a blog–maybe now is the time! 1) Teachers make a lot of decisions throughout the day. Sometimes we make so many it feels overwhelming. When you think about today, what is a decision/teacher move you made that you are proud of? What is one you are worried wasn’t ideal? In my new role, the most important thing is for me to grow in listening and helping teachers to reflect on their own practice. My temptation is to say “what I would do” is… I’m working on that. At times this week, I’ve done a good job of keeping this is the forefront of my mind. Other times, I’ve failed. I am praying that the wonderful teachers I work with will remember I’m a rookie at this and extend grace when necessary while I work to hone my skills. 2) Every person’s life is full of highs and lows. Share with us some of what that is like for a teacher. What are you looking forward to? What has been a challenge for you lately? Transitioning to this role was a risk. After all, I KNOW I LOVE teaching. Will I enjoy coaching? I’ve second guessed myself quite a bit in this first month. Teachers, who I considered my friends, are starting to treat me differently. While I was told this would be true and would be hurtful, the fact that it was expected doesn’t make it any less hurtful. If they knew my heart and my intentions, they would never question that they are for the good of all teachers and all students. I am here for support and encouragement. I want teachers to love their job, love their school and feel so supported and encouraged that there is no other school they’d rather serve. None the less, people question my motives and it makes me sad–flat out sad. 3) We are reminded constantly of how relational teaching is. As teachers we work to build relationships with our coworkers and students. Describe a relational moment you had with someone recently. This has been the biggest challenge for me–relationships are messy! I have to admit I don’t have the best “filter” when it comes to sharing my thoughts. What I do have going for me is that I am well-intentioned. A proverb says “Out of the heart the mouth speaks.” Since I know I have very little control over my mouth, I’ve committed to work on the nature of my heart. Are there issues of conflict that are unresolved? I best resolve those lest something dangerous sneaks right out of my mouth. Ugh! For that reason, I’m quick to fix things with others. I’ve had one misunderstanding this week that I was quick to resolve with a co-worker face to face (I’ve also learned to be careful with e-mail and that some conversations are meant to be face to face). Another co-worker, where I asked for grace and a second shot. Both were received gracefully and I’m so grateful that I work with people who can extend forgiveness so generously. 4) Teachers are always working on improving, and often have specific goals for things to work on throughout a year. What is a goal you have for the year? I have several goals. Probably my greatest goal professionally is to learn my new job. I am reading a book called the Art of Coaching by Elena Aguilar. This has been a great inspiration. I want to help teachers reflect on their beliefs about students, learning and innovation and not just coach teachers to do “what I would do.” This is definitely an ART and I am only an apprentice. My personal goal is to achieve a greater work/life balance. My daughter left for college this fall. She isn’t far but she isn’t here either. I have only three years left with my youngest and I want to make those years count. In addition, my husband and I will be empty-nesters in 3 years. I want to pour into us as we reinvent this relationship post-kids in the home. These are without a doubt my MOST precious priorities. 5) What else happened this month that you would like to share? I am a person who thrives when given positive feedback. While I am definitely open to constructive criticism, especially in my new position, the words of encouragement I’ve received from a few teachers has helped to keep me going through this transition. Perhaps I have made the right move. Ask me in January :). Give the students the PlayDoh. Let me explain. I think that the content we hope to impart to our students IS the PlayDoh. If we hold it in front of the room, explain how it feels, describe its general shape and color, our students will learn a few things about it. Imagine, instead, that we give them each their own PlayDoh. They feel it in their hands, pull it to see how far it will stretch, create new things out of it, then surely they will have a greater sense of what they are holding in their hands. They may get so caught up with it, they forget to pack up their bags before the bell rings. That’s flow! Plan the party. Okay, is it wrong to have two metaphors in one post? Well, I’m gonna…When you plan a party you need to create an environment of structured freedom. That may sound like an oxymoron. You wouldn’t invite 10 eight year olds to a party and say “Have at it!” They might get bored or worse-naughty! We plan games, activities and we manage them loosely so as to not be the party police. We structure the play, but let them play! Likewise, in order to send students in the right direction and give them an opportunity to play with our content in a productive way, we have to use some sound research-based structures: collaboration (“Let’s talk about the Playdoh and make a plan to build something great.”), asking higher order thinking questions (“What impact has Playdoh had on children around the world?”), and graphic organizers (“How does this Playdoh experience relate to other information I know?”). One caveat: Your activities must be “appropriately challenging to one’s skill level.” Be mindful of that when you’re planning the party. You wouldn’t plan a rollerskating party for toddlers. You wouldn’t, right? Watch it unfold. Usually it looks busy. It can be loud. It’s marked by “high levels of personal and work satisfaction.” Personally, this is the point where I find greatest joy in my teaching. Ironically, students oftentimes forget you are there. Don’t feel as though you aren’t working. You’ve done amazing work behind the scenes, Party Planner! As long as they have “Playdoh” in their hands and they are talking about it, writing about it and playing with it. Your mission is accomplished! They’ll be late to their next class because they lost track of time. That’s okay. Your class wins! They’ll be sad the party’s over. I’ve ALWAYS wanted to teach. Since I was a young girl. My dad had discovered a desk in the garbage at his work that was an exact replica of my teacher’s desk at school. I was thrilled. He also found a chalkboard which he mounted in the basement next to my recycled desk in my make-shift classroom. My sister was four and a half years younger than I. My curriculum, however, consisted of recouped purple dittos from my teacher’s garbage can. Therefore, as my pupil learning what I had just learned, she was well ahead of grade level. Her willingness to please her older sister made her a highly motivated student. Her kindergarten teacher reported to my mom that her writing was exclusively in cursive and could she be convinced to print, thank you. I love it all, the lessons, the learning, the art projects. I was hooked. However, who and what to teach was still a question mark for me all the way until I entered college. I loved learning and typically I wanted to teach whatever subject I loved most and at my current age. Since my last stint in school was in high school, I selected teaching high school. After all the content was so challenging and interesting. I was torn, however, between History, Spanish and Math. You might be surprised that I selected Math. Well, at least based on the responses I get from EVERYONE I tell that I teach high school Math. I loved that it was so clear cut. I could clearly discern whether a student understood the content or did not understand the content. It was step by step procedure and seemed “easier” to teach. Since then, I’ve changed my mind about Math’s predictability, methodology and the importance of unscripted rich problem solving. But, that’s for another time–this is the BEGINNING of my story. For approximately every 30 children in the US, there is a teacher. We are an army of face wipers, coaches, and empathetic ears. We deliver content, challenge, tutor and seek to inspire. But, what brought us to this point? What drove us to do, what I believe, is one of the most challenging and rewarding jobs? I’d love to hear your story! Please share in the comments below. Include in your response if you would have chosen the same age & subject if you could do it all again. Last year was the first time I co-taught Geometry with a Special Ed teacher. While originally hesitant to share my classroom (I definitely have control freak tendencies), I LOVED it! It was wonderful to have two professionals in the room to instruct, assess and care for our room full of kiddos. You can read a bit about my co-teaching reflections here. While my experience was extremely positive, that might not always be the case for all co-teachers. For some, relationships between co-teachers can seem like an awkward partnership. Some are just “playing nice for the kids.” We can do SO much better than that! 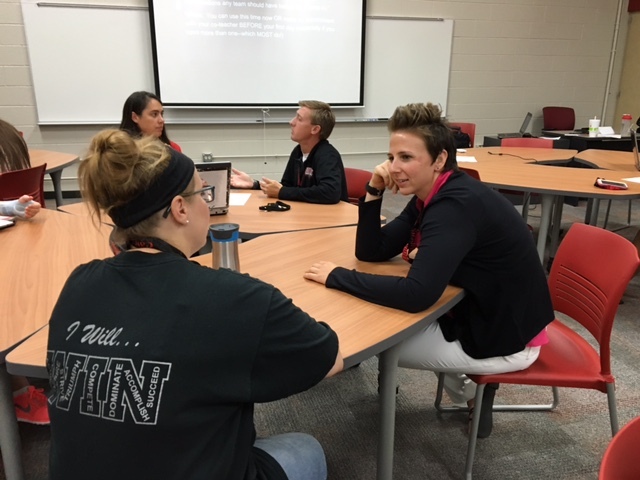 In an attempt to get a jump start on establishing solid co-teaching relationships, the instructional coaches provided a Co-Teaching workshop on the first inservice day of the new school year. After a brief presentation given by my co-teacher Jeff and I, and our new instructional coach Emily (who is a huge advocate for co-teaching) we provided an opportunity for a co-teaching “first date.” The “first date” consisted of a list of conversational topics from persona lity type to classroom management styles. The main objective was for teachers to find a common, workable ground for their classrooms. I’ve included both the presentation and the “first date” discussion sheet. Perhaps you and your co-teacher might want to have a “first date” as well? Best wishes to all those co-teachers out there partnering to provide the best possible experience for those sweet faces in their classrooms! Make this the #bestyearever . Being a Rookie Teacher is Not for the Weak! My role at school has changed this year and it has me feeling like a rookie all over again. I’ve already made a few mistakes and I haven’t even officially started! That hasn’t dimmed my excitement; however, but it does have me feeling reflective about my rookie years in the classroom. Part of my new role is serving teachers new to the field or just new to our school. I want them to know that I remember…it’s hard! But, it’s SO worth it! My first teaching job was a challenge. I graduated in December and was teaching in January in a small rural school. The department chair had, like many other educators, decided to leave the field altogether to join the private sector. I took over a few of her classes and they traded out her Calculus classes with another teacher and I took over a few of his classes. After all, I was just fresh out of the gate. They handed me an Algebra book and said, “get as far as you can get.” That was the curriculum, I guess. The tests were written by hand and each teacher wrote his/her own tests. I tried to partner with another young teacher who has since moved on to teach at another school (as did I). She was experimenting with cooperative learning, to the point that students received group grades on all things, etc. It was the 90s after all! I had one student who saw this tiny (I’m 5’2″ on a good day) little insecure teacher and would have a field day with me. I’d get anxious and sick to my stomach before that class everyday. He’d see every chink in my armor–every inconsistency. His class had been transferred from the teacher who still remained at the school. He was a baseball coach and well liked. Kids didn’t mess with him. He’s still there. I remember one student saying, “I don’t even remember Jake* being in the other class. But he’s all we talk about in this one.” I distinctly remember that girl. She was tiny and athletic. Had a tom boy mannerism about her that gave her a toughness that was intimidating as well. She had a buddy in the class who was a farm boy. He also played football and his appearance embodied both those things. He was tired on days they were seeding or harvesting because he woke up early. I felt that they were both judging me for not having all together. And I didn’t. I did everything I could to manage Jake. I called mom and she said he had no other issues with teachers. I talked to the dean. She said just write everyone up and she would deal with it. Really? I was just glad I only had him for a semester. I would start over next year and never let myself get wrangled into such a negative relationship with a student again. Ugh! Not to say I haven’t had issues with students. But, honestly, I’ve never felt they were out of my control or that I was helpless in solving them. I’ve come up with some tried and true methods that have yet to fail me. Through it all, though, I never doubted that I wanted to be a teacher. Not even once. I was born for this. Your thoughts? Did you have a rough first year? A student you went rounds with? Were you able to connect with that student for a positive outcome? This post could also be entitled: “Stuff I learned from Twitter over Christmas Break.” One of the things I love about break is the chance blog binge and peruse twitter for ideas. I have a folder in my g-mail entitled “Read over break” and LOVE when I get to crack it open. I bore easily and without new ideas, (gulp!) even teaching might become stale for me. 1. Wingman I watched a great little video regarding a strategy called Wingman from the Teaching Channel. Here the most pensive and quiet student is asked to engage by observing the group and giving feedback later. I highly value student to student communication in the process of learning. That being said, I know that my class must be an introvert’s nightmare. This will allow the introvert to be an observer and still participate in the learning. The video demonstrated the Wingman strategy in an ELA class but I would give it a little twist in my HS Math classroom. I’d most likely hand the “wingman” a sheet to keep a record of when students apply one of the 8 mathematical practices and encourage groups to make sure they touch on at least four or five of them. At the end the “wingman” could give a report to the group on their progress and point out individual strengths. 3. Kick me. The first rule of “kick me” is NO KICKING. Good to know. I found this great strategy on the Teaching Channel as well. I teach Geometry and this strategy allows me to help them solidify their understanding of the plethora of vocabulary associated with the topic. I would probably create a sheet that includes several figures that demonstrate the vocabulary word. Students would have the vocabulary words taped to their backs and would have to search out the matching vocabulary. This might be a great “beginning of the school year” activity that would allow them to mingle AND give me some idea what geometry concepts that they brought with them from middle school. 4. Better Quiz Corrections Okay, this one I THUNK up myself…well, sort of. It started when I began only highlighting errors on quizzes and giving students 5-10 minutes to make corrections after they were returned as a result of watching this fabulous video from…the Teaching Channel (have I mentioned how much I LOVE this Twitter follow?). I thought that I might make a half slip that students can fill out that might give them (and me) more feedback: You can view that here. 5. Reflecting on Student Work. This idea came also from a video from Teaching Channel but I can’t seem to find it. The idea is to take two students from the class and follow their work throughout the year. I would love if several of my colleagues could join me in this. We can see the types of errors our students are making and what antidotes we have, as a team, to counteract them. Since PLCs seem to be a major goal in our district and school this year, this sounds like a good place to start. 1. Formative Assessment – My co-teacher and I have freedom to regula rly require students to do a problem on a 1/2 sheet and turn it in. One of us can walk around to make sure students are on task and available for students with questions. The other can collect the sheets and offer quick feedback. We do this, typically at the beginning and end of class. 3. Foldables – I think these have been helpful to all of my students for taking down key information and/or formulas. In addition, students with IEPs may be allowed to use them on quizzes and tests. 4. Planning – We have a common plan! Though my co-teacher is often running around meeting with students during this period, he usually makes time to meet with me briefly to go over the next day’s lesson. That’s been fabulous! 1. Differentiation – It is still a difficult balance to not overwhelm some and bore others. One day, as an exit slip, we gave a more challenging problem to about 5 students that I had printed out earlier. It’s progress, but we’ve got a ways to go. 2. Grouping – Though it is nice to be able to group students who are stronger with some who are weaker in order to explain misconceptions etc., some of the stronger students are leaving the weaker in the dust. Should we group our weakest students together with either my co-teacher or I to coach them? Not sure. 3. Collaboration – There is not enough collaboration in this group yet. I’m not sure if weaker students are intimidated by the stronger or just have lost interest. I could also do more to encourage the communication. I thought about doing some brain-based instruction. Thoughts? What’s Mrs. J saying now?